Sunshine…that’s what I went to Spain seeking this spring: sunshine, warmth, and a reprieve from the chill of winter. And where better to escape to than the sunniest option on mainland Europe…Spain. So I spent April (and a tiny bit of May) in the mid-sized Spanish city of Toledo—an ancient walled city on a hill, half surrounded by a river, and just 30 minutes from Madrid. Sunshine I’d asked for, and sunshine I got. Walking up the hill to my rented apartment on the day I arrived, it was perfect tank top and shorts weather. Having breakfast each morning in my inviting, third-floor home, I was able to throw open the balcony doors and let the sunshine and light breeze stream in. My pretty, one-bedroom apartment, with views over the rooftops and its central location near the main pedestrian thoroughfares, cost less than $550 for the month I was there—including internet and utilities. Groceries cost under $350. Four visits to the veterinarian (turns out my dog is allergic to some Spanish plants) and four different medicines ran just over $100. And my total for a whole month in the sunny walled city (including transportation from southern Spain at the beginning of the month and transportation back home to Switzerland at the end of the month) was under $1,400. Toledo’s mild weather is perfect for spending lots of time outside…wandering the ancient, maze-like city center with small crowds of other springtime sunshine-seekers, buying charming souvenirs from the quirky little boutiques, or slowly meandering around the city on the many natural walking paths that circle it, weaving alongside the wide, curving river with the city on one side and a collection of hills and cliffs on the other. One particular walking path called to me: the Ruta de Don Quijote—named after the famous Don Quixote de la Mancha, a character from a novel who reads too many romantic and chivalrous stories, goes mad, and decides to bring justice to the world. The Ruta is a walking path that passes through 148 Spanish towns, including Toledo. Where the route winds around Toledo, there’s one stretch that makes its way slowly up a hill and to the best view of the walled, hilltop city. I made the 45-minute hike from my doorstep a number of times in the sunshine and coolness of the early evening and joined the locals to watch the beautiful spring sunset. 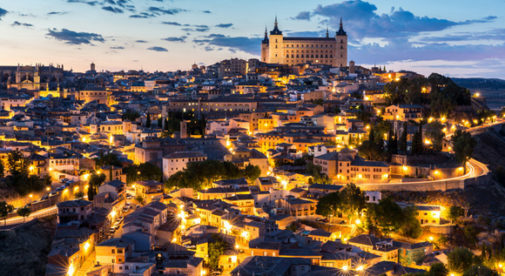 Long, lazy days…bright blue, warm skies, and a very affordable price tag…Toledo really does deliver on the promise of sunny, affordable Spain. Learn more about Spain and other countries in our free daily postcard e-letter. Simply enter your email address below and we’ll also send you a FREE REPORT – Live the Good Life in Sunny, Affordable Spain.